Leonardo da Vinci’s dream of building a magnificent bridge over Istanbul’s Golden Horn is finally coming true, in opera and in real life, 500 years after the great Italian artist suggested it to the Ottoman sultan. 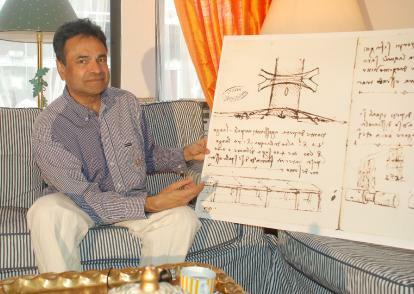 U.S. composer Daniel Nazareth has written an opera based on Leonardo’s vision while Turkish architect Hakan Kıran has begun working to build the bridge the artist imagined over the Golden Horn, also known as the Haliç. Five centuries ago, Leonardo wrote a letter to the Ottoman Sultan Bayezid II, suggesting the world’s biggest and most magnificent bridge be built over the Istanbul waterway. His letter, ignored by palace officials at the time, was discovered in the archives of Topkapı Palace in 1950. The final stage of the opera highlights the possibility for all people to live in peace in an independent and creative atmosphere. “That is to say, Leonardo’s bridge is used as a metaphor that establishes a link between different cultures and civilizations, East and West and rich and poor,” Nazareth said.